One of the most wonderful things about card games is the way in which they bring together people from all walks of life. Teaching someone a card game that’s near and dear to your heart – perhaps one from your childhood – is an excellent and underrated way to connect with and have fun with someone else. Most of us are familiar with at least the names of the most common North American card games such as poker, solitaire, hearts, and bridge. But if we step back from our ethnocentric perspectives, there’s actually an extraordinarily rich and largely undiscovered (by Canadians and Americans) world of card games from different places out there. By learning, teaching, and playing these bad boys, you can feel like you’ve journeyed to a different place without even leaving your kitchen table. Here are a few of our favourites (along with recommendations for some country-specific snacks you could serve alongside to enhance the experience even more!). The name of this game (also spelled ‘Teen Patti’ sometimes) literally means “three cards”. This gambling game is quite similar to the British game 3 Card Brag. The objective is to have the most valuable three-card hand. Before cards are dealt, all players must agree on the minimum bet and place that amount in the middle of the table. The dealer then deals each player three cards, and players place their bets. Sounds a lot like poker, right? Well, it is, but there are a few more differences, too. For example, nobody can show their cards until all but two players have dropped out. Those are some high stakes! You can also play Teen Patti online (for real money!) at 3Patti.com. 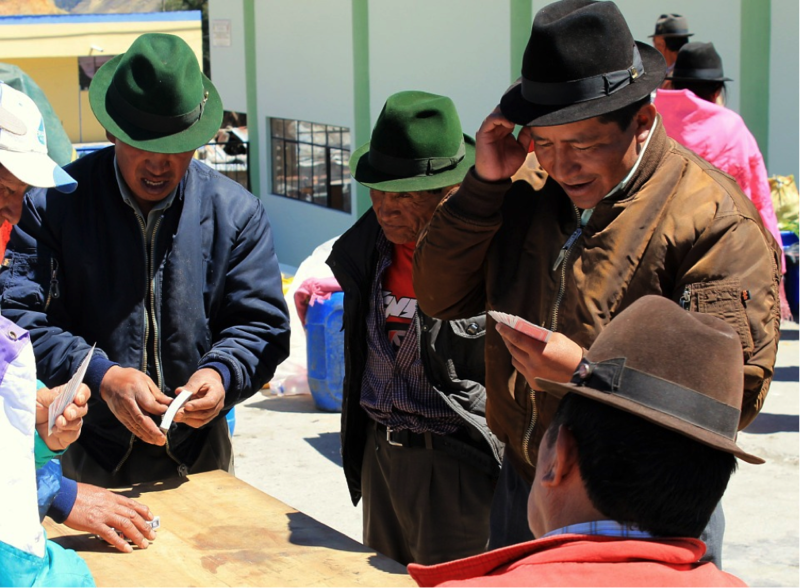 Kalooki is technically a form of rummy, but it’s nothing like the North American version of the game! It’s a kind of contract rummy that is often played in tournaments under the name “Super Rummy”. The game is played with 108 cards made up of two standard decks plus four jokers. The jokers can be used as wildcards to substitute for almost any card. Another version of Kalooki is commonly played in Trinidad and Tobago. Although it was technically invented in the United States, Five Hundred is referred to as the “national card game” of the Land Down Under — so it’s a pretty big deal there! It’s a four-player game that uses a pack of 43 cards comprised of a joker plus a standard 52-card deck with the twos, threes, and black fours removed. Five Hundred is an extension of euchre, and it is so named because the first player to reach 500 points wins. Other riffs on Five Hundred include Cinq Cents (a French Canadian game) and St. Paul Midway Five Hundred (a version played in St. Paul, Minnesota). Cucumber is a game of many names. In Denmark, it’s “Agurk,” in Finland, it’s “Kurkku,” in Norway and Sweden, it’s “Gurka,” and in Poland, it’s called “Ogorek”. Although the exact rules of Cucumber vary depending on which country you’re in when you’re playing it, it’s always a trick-taking game in which the objective is not to take the last trick. In Denmark, “Agurk” is also sometimes called “21” because a player loses when he or she has more than 21 points. Interestingly, unlike many of the games we’ve already discussed in this article, Cucumber is a pretty recently-developed game. It was popular with Northern European students in the 1970s and 1980s, and there is not much documentation of it having existed before then (although it may have evolved from another game called Krypkille). The closest game to Cucumber that exists in North America is the American game Twenty-Two. OK so this isn’t really a card game, but slot machines were originally called Poker Machines and in the ‘Land Down Under’ they are affectionately referred to as Pokies. You can find some fun online pokies in NZ here.